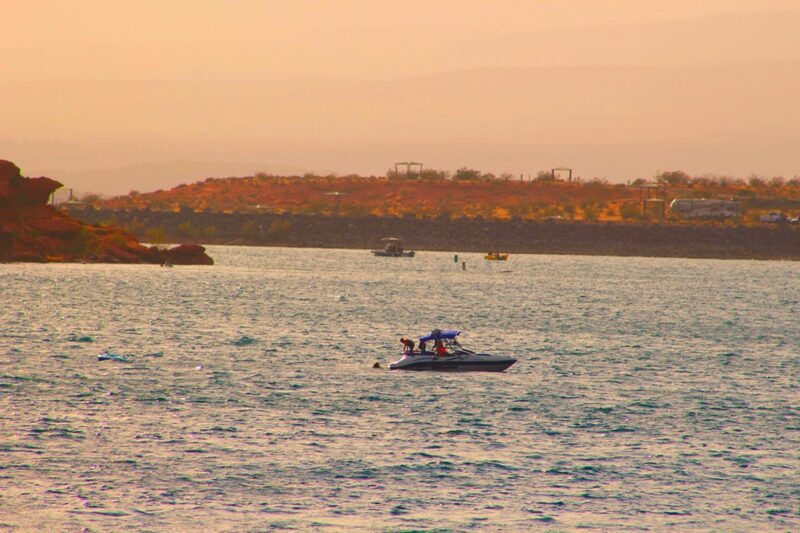 SAND HOLLOW STATE PARK — Three exhausted and dehydrated women were rescued from Sand Hollow Reservoir Saturday after spending a couple hours with their sinking personal watercraft before a passerby took notice of their plight and notified authorities. Shortly after 5 p.m. 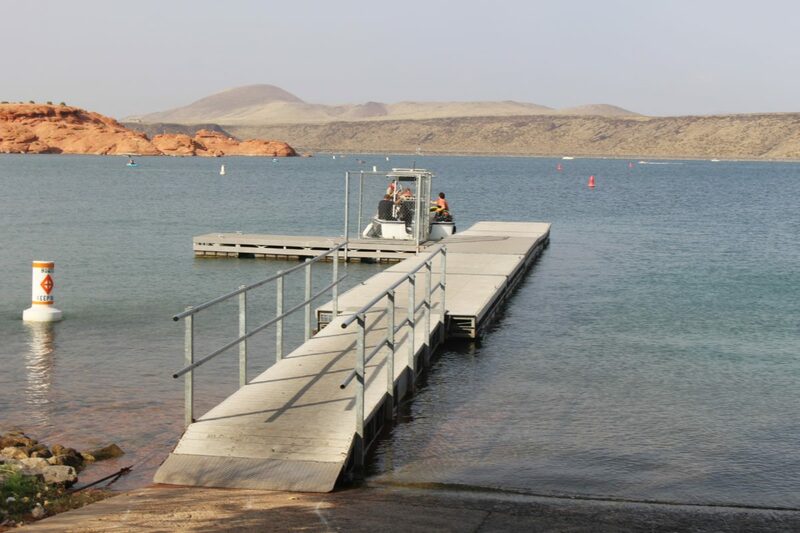 Sand Hollow State Park rangers received a report of three women stranded near a dock on the northeast side of Sand Hollow Reservoir, Washington County Sheriff’s Deputy Darrell Cashin said. 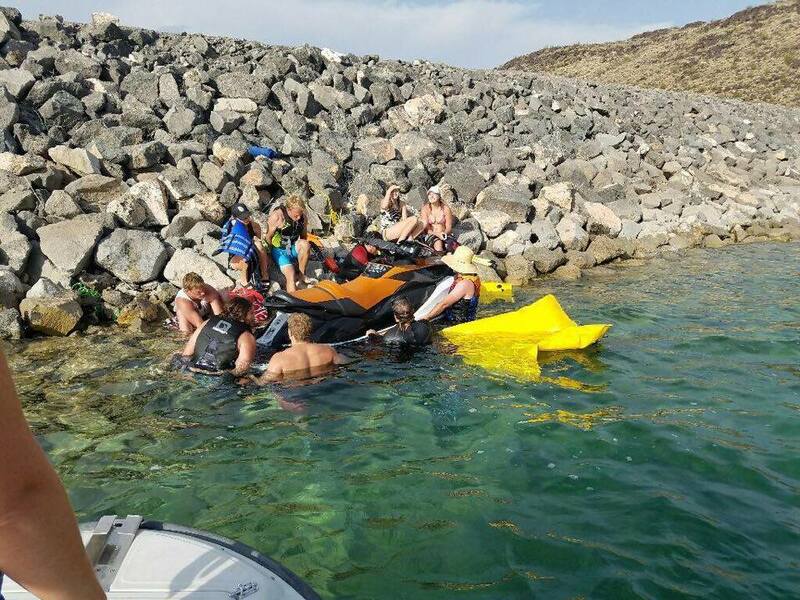 Park rangers responded to the area and found the women trying to keep a large personal watercraft from sinking completely underwater, the deputy said. They were physically holding it just above the water’s surface. The 19-year-old who brought the vessel to the lake told officers that her father loaned it to her for the day, Cashin said. Sometime after she and her friends began riding it on the lake, she noticed it was taking on water and continued doing so until it began to sink. She later realized she had taken the watercraft onto the lake without pushing the plug in. They tried to get it closer to shore and ended up dragging it to an area near the dock where they hung onto it just below the surface of the water for over two hours before anyone noticed they were stranded, Cashin said. Rangers found the women dehydrated and exhausted from being stranded for hours without water and with the added physical stress of holding up the watercraft. They were helped onto the rangers’ boat, given water and Washington County Search and Rescue’s dive team was contacted to recover the watercraft. 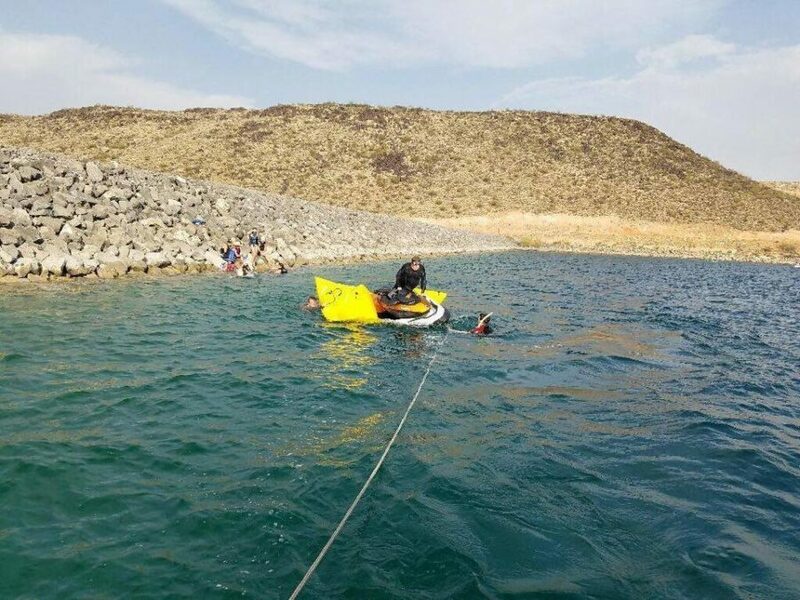 First, divers located the watercraft and then inflated two lift bags that were tied together and placed under it to lift it to the top of the water. From there, they could assess the damage and devise a plan to get it back to the shore. The team soon realized as the watercraft reached the surface that it was completely full of water. Even after draining most of the water it took on even more water, Cashin said. Additionally, the team found possible damage to the fiberglass hull, which prevented it from staying afloat. The team then tied the watercraft onto the back of the park service rescue boat and towed it back to the shore where it was loaded onto its trailer. Water continued to drain out of it. Cashin said this isn’t the first time the dive team has been called out to recover a the likes of a Jet Ski from the lake. Any motorized vessel or vehicle leaks fuel, oil and other contaminants once it sinks underwater. So the dive team responds, trained and equipped to quickly and effectively remove the object from the water, while removing contaminants and hazards at the same time. The women sustained no serious injuries from the incident. Once hydrated with plenty of water provided by the rangers and their watercraft recovered, they were able to leave the lake on their own. Dehydration is a real threat, Cashin said, whether hiking outdoors or spending time in the water. The intense heat draws moisture out of the body and a person can become dehydrated very quickly. Once the process of dehydration begins it is difficult to stop and can take time. Even after giving the person water the effects of dehydration continue to linger, Cashin said. The longer a person goes without water the longer it takes to restore the body’s balance. For those who are planning an outdoor activity Cashin recommends drinking more water the day or evening before. Continue hydrating throughout the day to reduce the risk of dehydration. If an accident or injury occurs and rescue isn’t immediate, a well-hydrated person has a much better chance of surviving until help arrives. Stranded for hours? Doesn’t anybody go to Sand Hollow anymore? Your comments are getting lamer. Either you are out of material, or out of dope. “For those who are planning an outdoor activity Cashin recommends drinking more water the day or evening before. Continue hydrating throughout the day to reduce the risk of dehydration.”… and plug in the plug on the watercraft. I can hear her now “OMG, my dad’s going to kill me!” She should be required to pay for costs incurred for saving her sorry a$$ and polluting the water. Just stupid.